Now in its third generation, the Forester received a major makeover for 2009, and the minor tweaking it receives for '10 should help it remain competitive in a rather crowded market niche. Tweaks for the new model year include the addition of a PZEV (Partial Zero Emissions Vehicle) version. PZEV is a standard set by the California Air Resources Board (CARB), and it's awarded to vehicles that comply with their "Super Ultra-Low Emission Vehicle (SULEV) standard, which calls for the elimination of "fuel-system evaporative emissions". Subaru explains that what it means in English is that its PZEV vehicles have 90 per cent cleaner exhaust emissions than the average new vehicle and, since today's average vehicle is pretty darn clean compared with vehicles of years past, that's good news for those who think mere mortal human beings have more of an effect on Mother Earth than the rest of the universe does. The current Forester looks quite a bit bigger than the previous generations, though it's actually only about three inches longer and less than two inches wider. It still feels more like a car to drive than an SUV, though, which suits me just fine. That said, my recent kick at the current Forester made me think it has lost something in the translation from the even more car-like models of old. Not that this isn't a terrific vehicle; on the contrary, it's a fine entry in this market segment. I just think I liked driving the older one better, despite all the new technology and tweaks Subaru has crammed into the current generation. That said, the Forester is still one of my favorite – if not my favorite – small SUV's and is definitely my favorite Subaru. 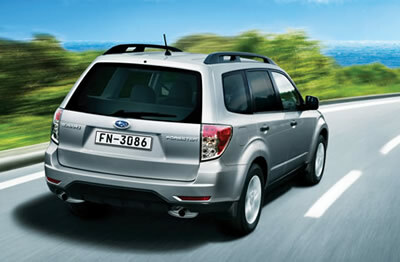 The Forester features an excellent greenhouse, which gives you very good visibility in all directions. This came in handy while on a road trip that took me on mostly high speed freeway roads infested by big rigs that come at you seemingly from all directions. I daresay it would also be wonderful in the great outdoors, off the paved roads; unfortunately, I never had a chance to take the Forester that Subaru's fine Canadian representatives loaned me anywhere near an off road situation – unless you consider parking lots "off road". Besides the PZEV model that I drove, other tweaks to Subaru's 2010 Forester include revised gauges with a new, real time fuel economy readout atop the center stack that apparently tries to make you feel guilty every time you goose the gas pedal. There's also a battery drain protection feature that, for example, shuts down the vehicle's interior lights after 20 minutes if you leave a door ajar when vacating the Forester. That's a handy feature! I don't know how many times in my years of driving someone has left a door ajar just enough to run down the battery, which is a real pain in the buttocks when you try to start the vehicle up again, only to find it sitting there immobile, as if laughing at your folly. The Touring Package available with the Forester 2.5X now comes with a leather-wrapped steering wheel and shifter knob, a 10-way power adjustable driver's seat (always a nice feature!) and three months worth of SIRIUS Satellite radio. I'm hooked on SIRIUS, and though I probably only listen to 10 of the 100 plus channels, I listen to them regularly and miss it when they aren't available. Subaru has also upped the ante on the 2.5X Limited, adding such stuff as a new multimedia option that includes a navigation system and Bluetooth. 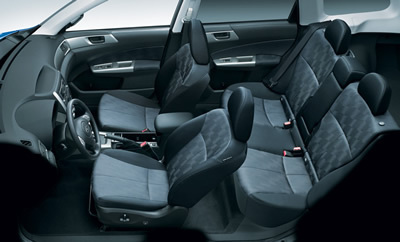 All Foresters get a new folding center armrest for the rear seat, which splits 60/40 percent and folds flat for storage, just like it should. Foresters equipped with the five speed manual transmission have a Hill Holder feature incorporated that can help prevent you from rolling back in that moment when you're letting out the clutch and moving your right foot from the brake to the accelerator. The manual would be my transmission of choice, since four speeds just don't cut it on an automatic any more – yet that's what Subaru offers here as an alternative. These aren't huge changes, of course, but the Forester didn't – and doesn't – need a lot of improvement. At its heart, it's still a nice all-wheel-drive alternative to traditional SUV's or "Cute Utes" that may only offer front wheel drive. The Forester also gives you just shy of nine inches ground clearance for off-road situations, deep snow, and speed bumps. That clearance would have come in very handy in my neck of the woods recently when we had about a foot of snow dumped overnight and, since my city doesn't plow the residential streets, led to deep ruts that caused many "mortal" vehicles to bottom out. Powering the Forester is the same normally aspirated 2.5 liter single overhead cam (SOHC), 16-valve, 4-cylinder boxer engine as before. It puts out 170 horsepower @ 6,000 rpm and 170 lb-ft of torque at 4,400. This is more than adequate for most uses, and if you don't think it is you can order a turbocharged Forester with 224 hp @ 5,200 rpm and 226 lb-ft @ 2,800 rpm. The base engine's a tad buzzy when prodded firmly, though not annoyingly so. As mentioned, my test PZEV Forester featured Subaru's four (and only four) speed electronic direct control automatic transmission with SPORTSHIFT, and it's a good sport shift. It needs at least one more gear, though, to be as modern in 2010 as it could be, and I noticed that in automatic mode it was reluctant to downshift sometimes when I wanted to pass slower vehicles – which was most of them. Forester's handling is very good, enhanced by a fully independent four wheel heavy-duty raised suspension, with MacPherson struts up front and a double-wishbone derriere. It feels good on the road, too, not too soft and not so stiff as to be bladder-busting. The four wheel disc brakes feature four channel ABS, electronic brake force distribution, etc. It's an easy vehicle to live with, with numerous nice touches. The windshield washers, for example, hose down the glass very well, with a wide and strong spray, and it seems there are about a zillion variable intermittent settings. There's also a rear window wiper with washer and intermittent setting. The steering wheel feels great in the hands and the overall driving position is very good as well. The new instrumentation is straightforward and clear, and the controls are laid out logically and are nicely at hand. The standard audio system is pretty good, and features an auxiliary audio input jack I used to exploit my iPhone on my long freeway drive. 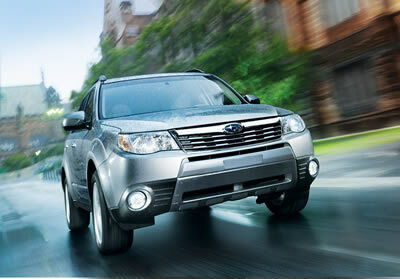 Safety equipment includes dual stage airbags up front, front side impact bags and side curtain airbags. There's also a new rollover sensor that can deploy the airbags if it figures you're about to go tush over tea kettle. You also get Subaru's vehicle dynamics control stability control system, electronic brake force distribution and active head restraints up front. The 2010 Subaru Forester starts at $20,295 U.S/$25,995 Canadian and goes up from there, depending on model and option packages.